Household food insecurity is a public health problem, but its causes are rooted in poverty, and thus potential interventions may lie in social policy. 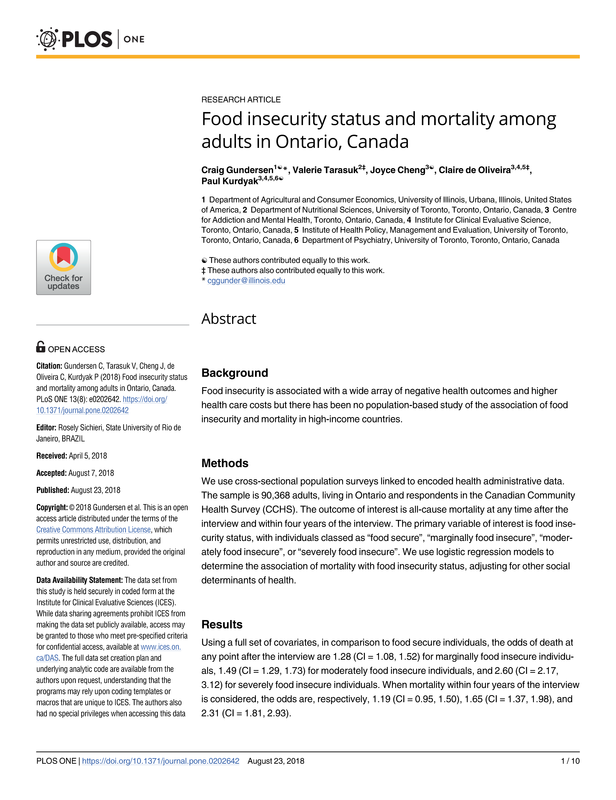 A thorough examination of the impact of social policy on household food insecurity has been impeded in Canada by the nature of the available data: household food insecurity is measured on a health survey (i.e. the Canadian Community Health Survey) that contains limited questions that are relevant to social policy. However, there is evidence that policy impacts household food insecurity. Most notably, the majority of people reliant on social assistance in Canada are food insecure, suggesting that these programs are not designed in ways that enable many recipients to meet basic household needs. Research has also examined the relationship of household food insecurity to policies related to energy cost subsidies, housing subsidies, and agricultural subsidies related to milk. There is no comprehensive policy framework in Canada designed to address food insecurity either federally or at the provincial or territorial level. 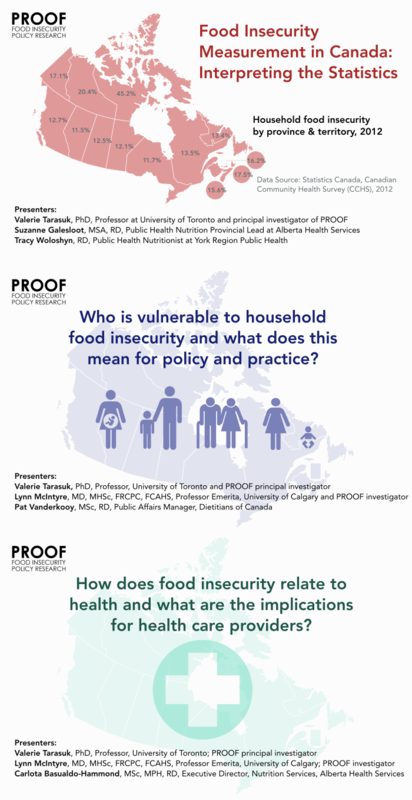 Many provinces have enacted poverty reduction strategies, but household food insecurity has not been an explicit focus of these strategies, nor has their impact on household food insecurity been evaluated. 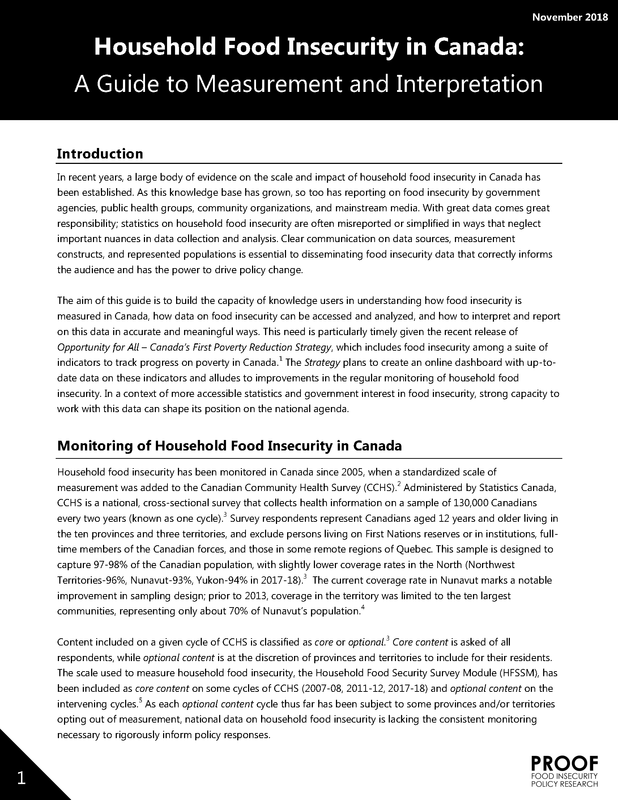 There has been very little written on these policies from a food security perspective, but some research suggests that current strategies in Quebec, which include support for emergency food programs, are insufficient to address food insecurity and disconnected from the desires and needs of food insecure households. There has been considerable criticism about Canada’s lack of a coordinated policy response to food insecurity. Although food banks and other charitable food programs continue to grow across the country, there is little evidence that community-based initiatives that are largely reliant on donated food and labour have the capacity to effectively address the very serious food problems facing the nearly one million households in Canada who struggle with food insecurity. Further, there is concern that these initiatives perpetuate the problem of household food insecurity and allow the government to abdicate responsibility. Internationally, Canada’s approach to food insecurity has been criticized with respect to adherence to international agreements to advance the human right to food. McIntyre L, Patterson PB, Mah CL. Social Science & Medicine 2018; 220: 176-183. Canadian Food Studies 2018; 5(3): 230-247. Tarasuk V, Li T, Mitchell A, Dachner N.
Health Promotion and Chronic Disease Prevention in Canada 2018; 38(5): 210-213. McIntyre L, Jessiman-Perreault G, Mah CL, Godley J.
Canadian Journal of Dietetic Practice and Research 2018; 79: 1-7. Gundersen C, Kreider B, Pepper J, Tarasuk V.
Empirical Economics 2017; 52(3): 1065-1087. Li N, Dachner N, Tarasuk V.
Preventive Medicine 2016; 93: 151-158. Critical Policy Studies 2016; 12(2): 149-168. McIntyre L, Patterson PB, Anderson LC, Mah CL. Critical Public Health 2016; 27(5): 566-576. McIntyre L, Dutton DJ, Kwok C, Emery JC. Canadian Public Policy 2016; 42(3): 274-286. McIntyre L, Kwok C, Emery JC, Dutton DJ. Canadian Journal of Public Health 2016; 107(2): e176. McIntyre L, Lukic R, Patterson P, Anderson L, Mah C.
Journal of Hunger & Environmental Nutrition 2016; 11(4): 441-455. Patterson P, McIntyre L, Anderson LC, Mah CL. Health Promotion International 2016; 32: 871-880. McIntyre L, Patterson P, Anderson L, Mah C.
Canadian Public Policy 2016; 42(1): 83-93. An Exploration of the unprecedented decline in the prevalence of household food insecurity in Newfoundland and Labrador, 2007-2012. Loopstra R, Dachner N, Tarasuk V.
Canadian Public Policy 2015; 41(3): 191-206. Ionescu-Ittu R, Glymour MM, Kaufman JS. Preventive Medicine 2015; 70: 108-16. Mah CL, Hamill C, Rondeau K, McIntyre L.
Archives of Public Health 2014; 72: 41-48. Tarasuk V, Dachner N, Loopstra R.
British Food Journal 2014; 116(9): 1405-1417. Emery JCH, Fleisch VC, McIntyre L.
SPP Research Papers 2013; 6(37): 1-20. Emerya JCH, Fleisch VC, McIntyre L.
Preventive Medicine 2013; 57(6): 963-66. Roustit C, Hamelin AM, Grillo F, Martin J, Chauvin P.
Emery JCH, Bartoo AC, Matheson J, Ferrer A, Kirkpatrick SI, Tarasuk V, McIntyre L.
Canadian Public Policy 2012; 38(2): 181-215. Gundersen C, Kreider B, Pepper J. Journal of Econometrics 2012; 166: 79-91. Applied Economic Perspectives and Policy 2011; 33(3): 281-303. Policy Options 2011; 32(7): 48-51. Williams PL, McIntyre L, Glanville NT. Journal of Hunger & Environmental Nutrition 2010; 5(2): 142-157. Gundersen C, Jolliffe D, Tiehen L.
Food Policy. 2009; 34: 367– 376. Hamelin AM, Mercier C, Gauthier J.
Canadian Review of Social Policy 2008; 60-61. Rideout K, Riches G, Ostry A, Buckingham D, MacRae R.
Public Health Nutrition 2007; 10(6): 566-73. Health and Place 2007; 13(1): 273-287. Canadian Journal of Dietetic Practice and Research 2003; 51: 67-86. Food banks and food security: welfare reform, human rights and social policy. Lessons from Canada? Social Policy & Administration 2002; 36(6): 648-63.